Horn Farm Center for Agricultural Education Receives Grant for Stream-side Planting Project! Riparian, or streamside, plant buffers are an effective way of reducing soil erosion and runoff of sediment, nutrients, and other potential pollutants. Agricultural runoff is largely responsible for much of the pollution in our regional waterways. To address this issue, the Horn Farm Center for Agricultural Education designed a riparian corridor restoration project. The Horn Farm was recently awarded over $24,000 towards the implementation of this design through Stream ReLeaf, a program jointly organized by Department of Conservation and Natural Resources, the Western Pennsylvania Conservancy, and the National Fish and Wildlife Foundation. This project will have numerous economic, educational, and ecological benefits for the community. Horn Farm Center will be able to demonstrate various productive uses of a multifunctional buffer. The stream corridor itself will be cleared of invasives and planted with natives, including black walnut, sycamore, and red maple. The funds will help Horn Farm Center establish an orchard of pawpaw and persimmon alongside rows of mixed berry varieties for fruit production. Silvopastures, which combine trees with grassy areas for grazing animals will be planted. Plants in the silvopastures will be selected to boost honey production for local beekeepers. A section of mixed species for woody floral production will supply the burgeoning local floral market. The awarded funds will also contribute greatly to The Horn Farm Center’s education offerings. The Center currently offers a variety of programs, including educational workshops, educational internships, and onsite support in the form of an incubator farm. 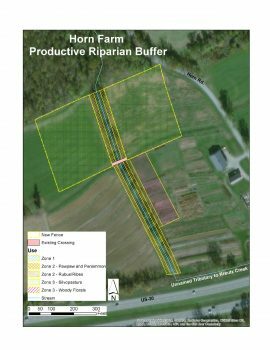 The multifunctional riparian buffer will allow for the expansion of the farm’s educational offerings, with newly created spaces for research and teaching about agroforestry and perennial farming. As a leader in regenerative agriculture, the Horn Farm Center focuses on land management practices that not only “do no harm” but actively seek to revitalize the soil and surrounding environment. Buffer plantings are proven to reduce sediment and runoff from farming. Buffers also improve water infiltration which will help keep valuable water on the farm. With funding from the Stream ReLeaf Program, the Center will be able to reintroduce more than 35 species of native plants to 6.1 acres of degraded stream-side woodland ecosystem. In addition to improving ecological health on the farm, this project will positively affect the health of waterways downstream, namely, Kreutz Creek, the Susquehanna River and eventually the Chesapeake Bay. 2077 trees and shrubs are scheduled for planting this fall and in the spring of 2019. The Horn Farm Center is seeking additional funds and volunteers for this ongoing ecological stewardship project. Please contact Community Outreach and Development Specialist, Kristi Allen at outreach@hornfarmcenter or 717.757.6441 if you would like to get involved. Celebrate the bounty of the season! Meet your local farmers! Join us Tuesday, August 21 – 6 pm – 8:30 pm for our annual Seasonal Eat & Meet at John Wright restaurant. Gather with your friends, family, and co-workers to meet and mingle with our farmers and producers who are passionate about supporting local farm businesses. 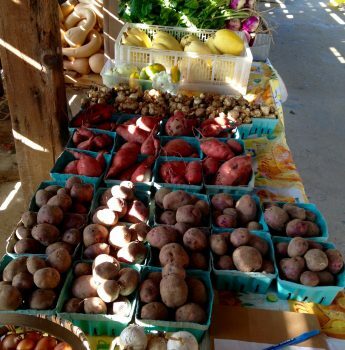 Enjoy a delicious meal of seasonal local foods prepared by the chefs of John Wright Restaurant! Proceeds will benefit the Horn Farm Center for Agricultural Education.